Doc Martin isn’t leaving anytime soon. ITV just announced they’ve renewed the TV show for a ninth season. The UK dramedy, which airs on Acorn TV in the U.S., stars Martin Clunes as the only doctor in a small Cornish village. The cast also includes Caroline Catz, Ian McNeice, Joe Absolom, John Marquez, and Selina Cadell. Earlier, star Martin Clunes was reported as saying season nine would be the last for Doc Martin, but ITV has not confirmed the news. What do you think? Are you a fan of Doc Martin? Are you excited for the upcoming season? 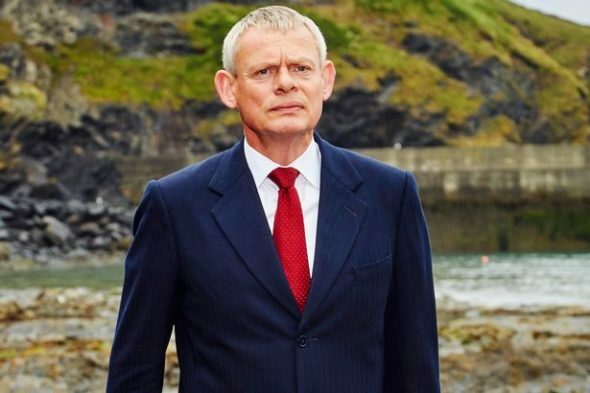 More about: Doc Martin, Doc Martin: canceled or renewed?, ITV TV shows: canceled or renewed? My husband and I love Doc Martin and all the wonderful characters on the show. We hope it continues for a long time. We are currently watching reruns and still giggle and can’t wait for a new season. Another viewer said “It’s like a Christmas gift” and it truly is. We plan NOTHING on the night the show is on. Wouldn’t miss it! Thank you!! I am thrilled beyond words about the return of the show. I have never been so drawn to any show as I am “Doc Martin”. Mr. Clunes is an outstanding actor…we are treated to such wonderful stories that are so well written and portrayed by not only Mr. Clunes but all the actors and actresses sharing their acting talents. Each episode is like a Christmas present..the anticipation..the discovery…..
and the pleasure of being on the receiving end. Not only is this a good series, with incredible story line and colorful characters, it is a virtual escape for me to the beautiful city of Cornwall. If it were possible, I would be moving there. Thank you for extending my vacation! My husband and I love Doc Martin, so funny and interesting characters! Best show ever!!! Witty, insightful, unique and just pure fun. Amazing story lines and characters. Educated or dumb, Dr.Martin is real life to its’ fullest. Love this series and its quirky characters! We are very excited to hear there will be another season. This is our favorite TV show. I agree with Babi I wish more British shows were produced. We enjoyed As Time Goes By. Watching the reruns would be great too. Huge fan! Wish I could visit! I’m very excited that Doc Martin is coming back!! I wish they would consider more more British series!! Netflix has lots of the British TV Series. Prime probably has them to. I also love Acorn TV. I watch all their shows on my iPad for only $4.99 a month.